In just three days’ time, the MLS Conference Finals will kick off. We’ve had a long season of football, with 34 regular season matches and now two rounds of finals action. The Conference Finals are effectively, well, just that – the match to determine the best team in the Western and Eastern conferences, and the match to qualify two teams to the MLS Cup Final on December 8th. Here’s what you need to know. From the Eastern Conference this year, we’ve got Atlanta United and New York Red Bulls. The Western Conference is contributing Sporting Kansas City and the Portland Timbers. That’s not much to go off, so here’s a quick rundown of each side. This is just the Five Stripes’ second season in Major League Soccer, but they’ve made one heck of an impression so far. Last season, they finished fourth in the Eastern Conference, which qualified them for finals football. However, they went out in the Knockout Round (the first round) on penalty kicks to the Columbus Crew. This season, Atlanta have upped their game even more, finishing second in the Eastern and qualifying for the 2019 CONCACAF Champions League. Venezuelan national team regular Josef Martinez has led that push with a huge 31 goals, the most ever scored in an MLS season, overtaking the 27 scored by Roy Lassiter, Chris Wondolowski and Bradley Wright-Phillips in 1996, 2012 and 2014 respectively. Once you see those numbers, it’s obvious why United are the top scorers this season, with 70 goals. Miguel Almiron and Julian Gressel have been immense with their 14 assists each this season, and both of them – plus Martinez – are 24 or 25 years of age, meaning they’re coming into their prime. In addition, goalkeeper Brad Guzan, formerly of Aston Villa, has eight clean sheets (shutouts) this season, and Martinez, Almiron, Guzan, defender Michael Parkhurst and midfielder Ezequiel Barco were selected for the 2018 All-Star Game, held in Atlanta. The Red Bulls have been going a little longer than Atlanta United – they were a founding member of the MLS, known at the time as the New York/New Jersey MetroStars. In 2006, the Austrian trash-makers and football-destroyers over at Red Bull swept in and purchased the club, rebranding it. That said, they’re still nicknamed the Metros. Last season, they finished sixth in the Eastern, qualifying for finals but going out in the Conference Semis to eventual champions Toronto. In 2018, they’ve gone better – they topped the Eastern and won the Supporters’ Shield (top of the regular season) to boot. That’s despite a coaching change midseason which saw old manager Jesse Marsch become assistant at Leipzig in Germany. In terms of players, they’ve got ex-Premier League player Bradley Wright-Phillips, and with 20 goals to his name for the season, he’s not doing badly either. He’s supported by Alejandro Romero Gamarra, with the Red Bulls’ new signing making fourteen assists. The Metros also boast having the best goalkeeper in the division by clean sheets – Luis Robles has fourteen – and he’s a big part of the reason they’ve conceded just 33 goals this regular season, the least in the league. In terms of All-Star quality players, Wright-Phillips is in there, alongside midfielder Tyler Adams and a defensive partnership of Michael Murillo and Aaron Long. In the Western Conference, we’ve got Sporting Kansas City, the only Big 5 team based in Kansas (yep, the Big 5 is totally a thing). The Wizards are the only team left in the MLS Cup this season with more than one championship – they’ve got two, whilst the Timbers have one and neither Atlanta nor the Red Bulls have won one yet. Also founded in 1996, Sporting KC finished last season fifth in the Western and lost in the knockout round to Houston Dynamo. They’ve jumped up the table this season, with a first-place finish in their conference, although they still sit behind both Eastern finalists on points. And it’s not like they’ve done this with a star-studded side – with all due respect to SKC, their squad isn’t full of the big names. One big name is goalkeeper Tim Melia, with thirteen clean sheets for the regular season. Former Betis midfielder Felipe Gutierrez and Andreu Fontas, once at Barcelona, are also in the squad. Kansas City’s top scorer for the season is the Scot Johnny Russell, with just 10 MLS goals. Looking at their squad, it’s hard to see exactly where the goals have come from, but they have, with Sporting KC being the fourth-highest scorers of the season. And yes, of course they got a few in the All-Stars, with defender Graham Zusi and midfielder Ilie Sanchez finding their way into the squad. The Timbers, like Atlanta, are an expansion side. Founded in 2011, they’ve managed to lift the MLS Cup once, in 2015. Portland perhaps stand out among this crop of sides in that depending on what metric you use, 2018 may be considered worse for them than 2017. They’ve gone from first in the Western Conference down to fifth, but they’ve gained one point in the regular season and made it (at least) a round further than last season, where they lost to Houston in the Conference Semifinals. In terms of top players, there’s not much to talk about from this season. Their one All-Star representative is brilliant midfielder Diego Valeri, who’s been running the show in Oregon for what feels like forever, but is actually since 2013. In goal, Jeff Attinella has been a decent replacement for Kiwi Jake Gleeson, and there’s another Kiwi in the squad in Bill Tuiloma. Apart from that, there isn’t much to say about the Timbers. They’ve been OK at best for most of the season, with a +6 goal difference, the eleventh-best attack and the eighth-best defence. They qualified for the playoffs by six points only, compared to 14, 23 and 25 for the other sides in the Conference Finals. And, because of their fifth-place finish, they had to play one more round of football than the other Finalists. The Conference Finals start on Sunday US time, Monday NZ time. Atlanta meet the Red Bulls in Georgia at 5pm Eastern Time (11am Monday in New Zealand) before Sporting KC visit Portland, with that match kicking off two and a half hours later. These matches are double-legged, however, and the second matches will be on Thursday US time, Friday NZ time. New York host Atlanta first, at 7:30pm Eastern (1:30pm NZ) and two hours later, Kansas City welcomes the Timbers. Only then will we find out who will meet in the MLS Cup final on December 8th. After years of wait, David Beckham has finally announced the name and logo of his MLS club. 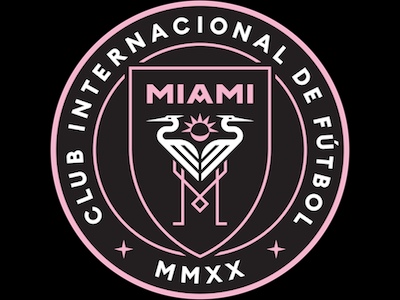 The Miami-based side will take the name Club Internacional de Futbol Miami, or Inter Miami for people who just can’t be bothered with all that nonsense. We’re finally getting closer to the club’s launch after a saga lasting since 2013, and Inter Miami are poised to enter the league in 2020. By then, FC Cincinnati will already have been promoted from the United Soccer League, the second tier of football in the United States. Miami will join Major League Soccer alongside a team from Nashville, Tennessee, which is yet to be named. 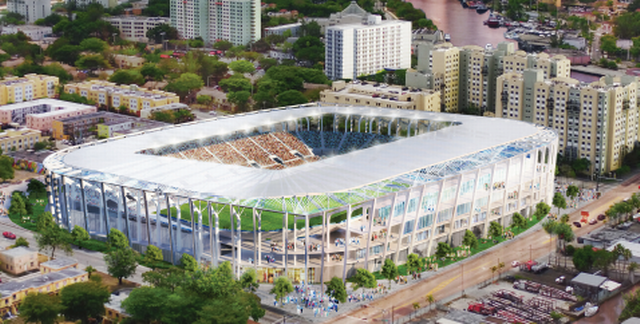 This is the proposed stadium for Overtown. Beckham’s side are developing well, but there’s still progress to be made. Their stadium location is not yet finalised with Beckham wanting to build a 25,000-seater stadium on the waterfront. There are also proposals to build either near Miami International Airport or in Overtown, in the north of the city. Miami Fusion, who played in MLS from 1998 to 2001, had their home games at Lockhart Stadium in Fort Lauderdale, however this only seats 17,000. Of course there are other grounds available in the city, such as the Miami Dolphins’ Hard Rock Stadium, but two gridiron teams already play there. The side had been called many names throughout the past few years. 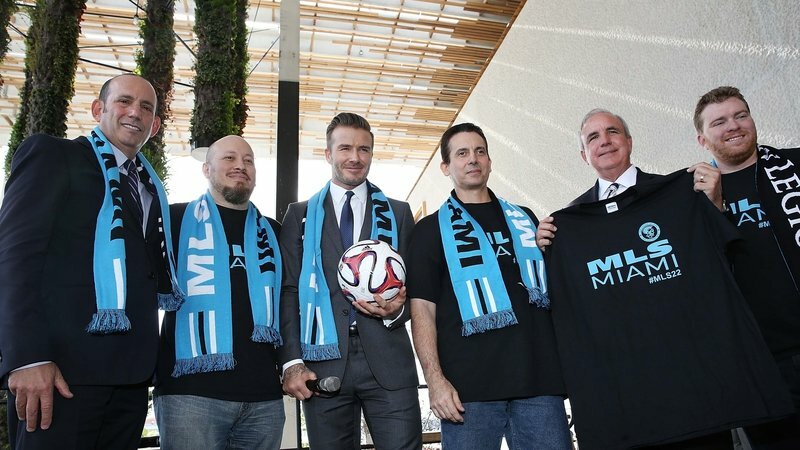 Beckham’s ownership group commonly referred to them as Miami Vice or Miami Current, and the project in general was known as Miami Beckham United. Inter Miami will not be the first side in MLS to use a Spanish-influenced name. That honour goes to Real Salt Lake from Utah and Chivas USA based in Los Angeles, who each joined the league in 2005, although Chivas no longer exists. The club’s colours will be black, white and pink, with a fairly similar shade of pink to Italian side Citta di Palermo. Beckham has said of the logo that he was inspired by typical South American club logos. Clearly they’ve paid attention to detail – the sun in the middle of the crest has seven rays, a homage to Beckham’s iconic No. 7 jersey. When the club join the league in 2020, provided everything goes to plan, there will be 26 clubs in MLS from seventeen states plus D.C. and three provinces of Canada. Expansion is expected to continue further, with the league aiming to reach 28 teams eventually. These extra teams would likely be in Detroit, Sacramento or San Diego. The footballing world heard the news today that after fifteen years, over two hundred goals and six trophies, Clint Dempsey has announced his retirement aged 35. 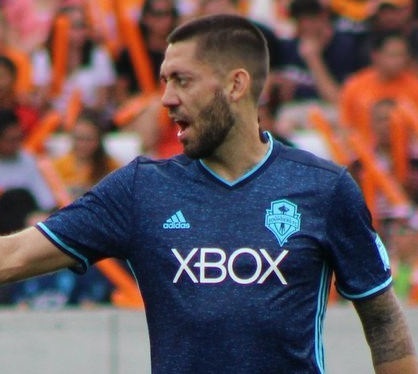 Now, when I think of Dempsey, what comes to mind is his time at Fulham in the Premier League, and of course, with Seattle Sounders in Major League Soccer. I think of his international career, in which he scored fifty-seven goals over the course of fifteen years. I think of his iconic No. 2 jersey he wore with both Tottenham Hotspur and Seattle. And of course, I can’t forget the time he stole an official’s notebook and tore it up on the field. But of course, there’s more to Deuce’s career than that. I figure now’s a good time to take a look back on it, so we’re going to do just that. Dempsey’s early life wasn’t easy by any stretch of the imagination. Born in a small city in eastern Texas, he grew up living in a trailer park and kicking a football around with the other kids there. He only really got his break by a stroke of luck, being noticed by a scout whilst juggling on the sidelines of his brother’s game. Eventually, he was forced to quit because of financial constraints but team-mates offered to pay some of his fees. His sister passed away when he was just twelve years old, but this gave him a new motivation to keep succeeding. After success playing for a top-level Dallas youth side, he moved across the country to South Carolina and Furman University to study health and exercise science. And yes, of course he joined the football team, the Paladins, scoring seventeen goals in three years there and leading them to the Round of 16 in the NCAA tournament for just the second time in their history. Dempsey was selected in the first round of the 2004 MLS SuperDraft by the New England Revolution. Now at the age of 20, Dempsey had to make an impression for the Revolution if he really wanted to push on – and that he did, starting all matches but one and picking up MLS Rookie of the Year 2004. The year after, he pushed on further, reaching double digits for the first time and taking the Revs to the MLS Cup Final. And in 2006, despite injury problems, he still managed to score eight goals in twenty-one matches and went to the World Cup in Germany, being the only US player to score a goal. Of course, foreign sides started to take interest, as they do, and Fulham swooped in to sign him for $4 million USD. This might not sound like a lot, but it was 2006 and this was the most an MLS player had ever been sold for. And with that, Dempsey was a Cottager. I would be lying if I told you he adjusted right away. In that first half season, he struggled. Dempsey netted only one goal in twelve matches, not exactly great for a forward. However, this was the goal that secured a 1-0 win over Liverpool, which kept Fulham in the top-flight. It was the season afterwards he really started to push on, with one goal becoming six, then eight, then nine, then thirteen. This doesn’t sound like a lot, but it’s worth remembering that there’s only so many goals you can score when you play for Fulham. In this time, he scored some pretty important goals. For example, in 2010, he scored the winner against Juventus (yep, this actually happened) with a well-taken chip, which has been called one of the most important goals, if not the most important goal in Fulham’s history. He took this side to the Europa League final, where they lost to Atletico Madrid. And also in 2010, for the second World Cup in a row, he managed a goal, against England in a 1-1 draw. It’s now 2012. Dempsey’s just had the season of his life. He’s scored twenty-three goals – seventeen in the league – and he’s become the first American to reach fifty goals in the Premier League. The FWA Footballer of the Year award rolls around and he manages to come fourth, behind Robin Van Persie, Wayne Rooney and Paul Scholes. Of course, playing this well, there’s only so long he could stay at Fulham and in August 2012, he crossed London to Tottenham Hotspur. Dempsey stayed at Spurs for only a year, scoring seven goals in twenty-nine league matches. His form outside of the league was better, with five in fourteen, but he wasn’t reaching the heights he had at Fulham, or that other strikers at the club had. That season, he was outscored by both Gareth Bale and Jermain Defoe, and instead of being in a starring role like he’d been in at Craven Cottage, he was one of the supporting cast. It’s no surprise that just a year later, he went back to the United States, and barring a two-month loan back to Fulham, that’s where he spent the rest of his career. The first half season at Seattle Sounders wasn’t a great one, as Dempsey scored once in nine league games. However, he flourished in 2014, scoring fifteen times in twenty-six matches, his best season ever in MLS. He also managed ten assists and took the Sounders to a Supporters’ Shield win. And of course, he scored at the World Cup, after just half a minute against Ghana. From here, Dempsey’s career began to wind down. Fifteen goals became ten, then eight. In 2017, he had a better season, scoring twelve in the league and winning the Comeback Player of the Year, but with poorer fitness leading to speculation about his retirement, it was clear his career was coming to an end. After just one goal this season, Clint Dempsey retired. The influence he had on the sport in America cannot be understated. Players like himself and Landon Donovan helped to elevate football in the United States to higher than it had been before. Dempsey brought America to the Premier League, sure, but he also brought the Premier League to America. He gave Americans someone to root for, and I think that will be his real legacy: bringing American football and European football closer together.